Long before I became a “Terror Dave” or even knew what a “blog” was, there was only one fan event I attended regularly. 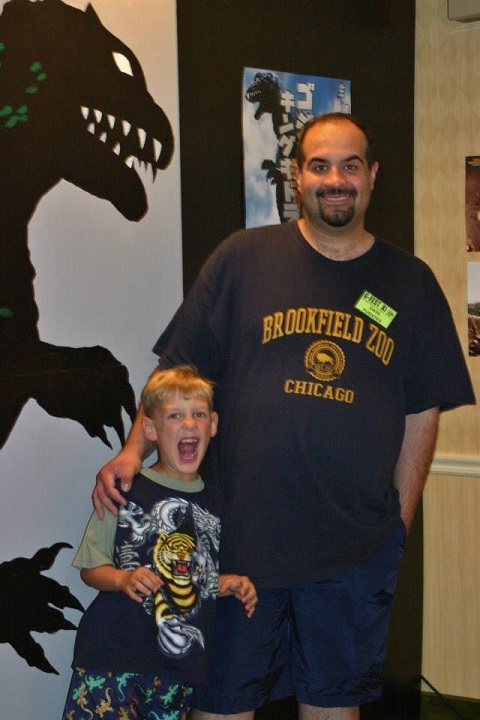 It was exactly ten years ago that I experienced my first G-FEST (Godzilla Festival) and it would not only become something I’d look forward to every year after but one my kids would anticipate even more than Christmas itself. It all started in the late ’90s while I living in an apartment in Alsip, Illinois. There was a local comic book shop down the street called “Best Sellers” and I’d often have conversations with one of the women who worked there. Her name was Sue and she was a geek like me though decisively more attractive. Sue wasn’t just some gal running the register; she actually KNEW what was going on in the comic world and was a huge fan of Godzilla. During one of our many conversations she mentioned G-FEST to me and, though I told her it sounded great, had no intention of actually attending one. In 1998 the Tri-Star GODZILLA was released and there was a tremendous amount of hoopla leading up to it. I remember in Chicago seeing the CTA buses drive by with huge banners on their sides stating “He’s BIGGER than this bus!” etc. Many Godzilla fans breathe atomic fire from indigestion when you mention this film but, while I didn’t care for it much, it did lead to some good things. One of these was a Godzilla marathon playing on what is now the SyFy Channel and hosted by Roger Corman. It came out right before the movie debuted as a means of firing up the fans. It was the first time I’d watched a Godzilla movie since I was a kid and it was a lot like rediscovering an old friend (a few years later I’d rediscover Svengoolie and my inner self would be complete). While my wife worked nights, I’d stay up and watch Godzilla movies (Sue introduced me to the ’90s Heisei series which I really enjoyed) not knowing that my toddler son, Alex, was sneaking out of bed and often watching with me on the floor next to the couch. At the end of his kindergarten parent/teacher conference, his teacher stopped my wife and I just as we were about to leave saying, “Oh…I wanted to show you something interesting.” Apparently the kids were given an assignment to draw something they loved and, while 95% of the class drew their parents and the occasional pet dog, Alex had drawn a picture of Godzilla. Making it even more interesting was that he took the time to write below it, “I Love Godzilla” with correct spelling and no template (couldn’t spell his last name at that point but no problem with “Godzilla”). It wasn’t long before he could perfectly mimic all the kaiju “calls” and sounds while also humming each of their theme music (I didn’t even realize King Ghidorah had his own song until Alex pointed it out). I remembered as a kid drooling while watching Godzilla vs Hedorah (The Smog Monster) when I saw a young Japanese kid in the movie playing with Godzilla toys. I was determined that, unlike me, my son would grow up having a Godzilla of his own, and immediately hit eBay and got him one. We even had a Godzilla themed birthday for him. Of course by 2004 he also had his younger sisters, Leia and Jade, in on it too. My youngest son, Luke, was born earlier that same year and has since gone on to be an even bigger G-Fan than Alex. I’d moved from Alsip and Sue had long since left the comic shop but I remembered her telling me about G-FEST and I knew that if this event was still taking place, the kids had to be there. I was absolutely right! 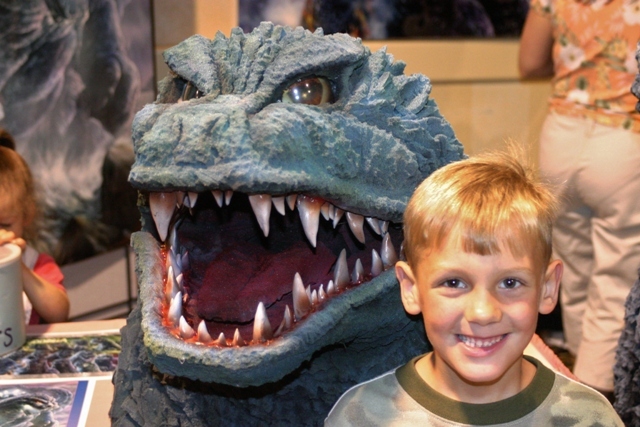 G-FEST had something for every Godzilla fan, young and old. 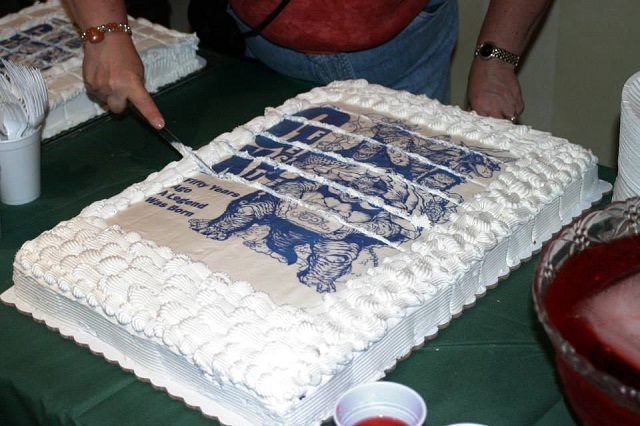 It hasn’t been until the last few years since becoming a Terror Dave and attending a LOT of over conventions that I learned just how special G-FEST truly was. The event is run by fans who are less interested in making a buck than they are about creating a fun environment where we G-Fans celebrate together without fear of ridicule. All my kids would enjoy this event and loved having an opportunity to play with other Godzilla kids. This adult kids enjoyed attending the forums and seeing these films again with fellow fans as well as meeting some of the great talents behind them. I have already explored the many activities offered in a former post (HERE). This year it’s just Luke and I going and, after seeing the latest GODZILLA movie stomp the box office (multiple times) we’re really excited about it, This will be the first time I’ll be staying at the hotel and enjoying all the event has to offer since the year this site began in 2010. Now, join me as we celebrate both of the Big G’s (Godzilla & Gamera) and Japanese Giant Monsters! 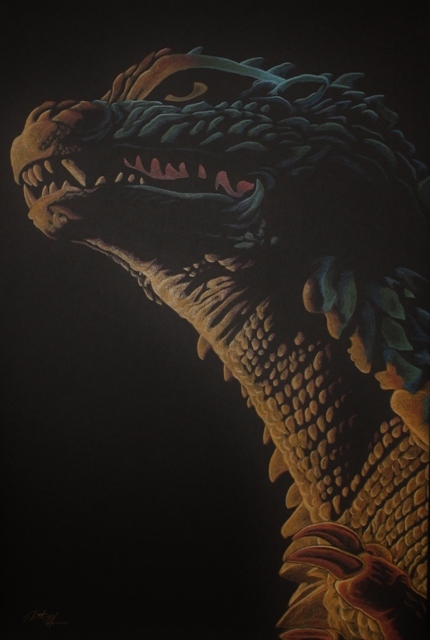 This entry was posted in Atomic Monsters!, Convention & Expos and tagged G-Fest, Godzilla. Bookmark the permalink. ← 2014 C2E2 Cosplay: Creative, Cool, and downright CRAZY!